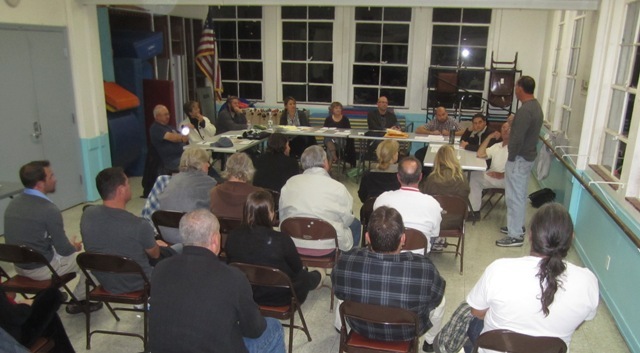 The OB Planning Board meeting of Jan. 2, 2013. The annual election for the OB Planning Board is coming up on March 11th. In order to be a valid candidate, an individual must attend at least one planning board meeting before the election. There are only two meetings left before the election, Wednesday’s and the Project Review Committee meeting on Feb. 19th. To clarify the attendance requirements: The OB Planning Board bylaws state that a candidate must have attended at least one meeting in the 12 months PRIOR to the February meeting. 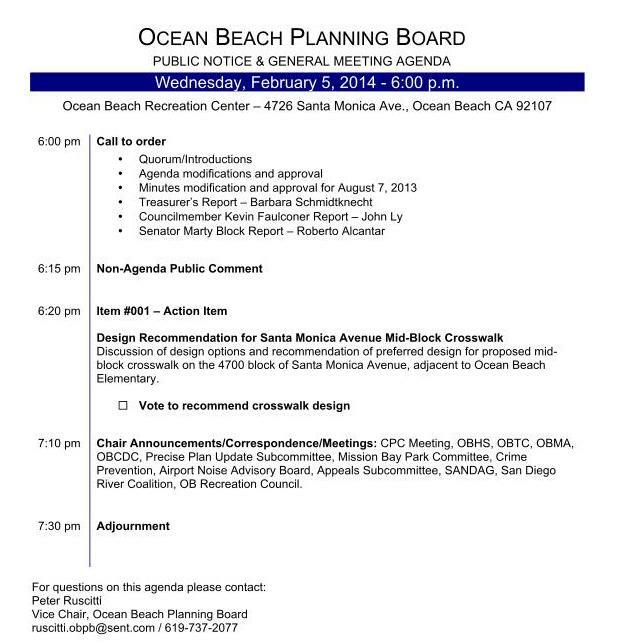 So that would mean attending one OBPB meeting between February 2013 and January 2014. The candidate must provide the meeting date on the application form. Thanks Pete for the clarification. Is there any appeal process on an issue like this; for instance, if someone just today got excited to run as a candidate – but whoops! too late for they have missed the Jan. meeting (assuming that they have never attended a meeting), is there anything they can do? Frank – I’m not 100% sure, but I don’t believe that is an option. The OBPB bylaws are very clear about the attendance requirement and I’m not aware of any circumstance that would allow the Board to deviate from its own bylaws. The bylaws (and any changes to them) must be approved by the City Council. The Election Committee has suggested a few changes to the bylaws that hopefully could increase participation in elections (pertaining to deadlines, registration rules, electronic voting, etc.). But due to the requirement for City Council approval, this is not something that we can implement quickly. Pete, thanks for the clarification. Any further discussion on this should probably be taken up by the Board tomorrow, lest your responsiveness be taken as speaking for the board or serial communication (via the fact that other Board members may read this blog). I bring this up because of my post below and not wanting you to get into Brown Act territory just for answering questions or responding to our concerns. I’d second this, Frank… especially given that the 2014 election application was not even approved until *after* the January General Meeting, effectively disqualifying anyone who did not already have documented attendance at a General Meeting in the previous year — including most lifetime OB residents or even someone like myself who just finished up 4 years on the Board in 2012 (and who was thinking of running again). The bylaws are clear enough, but that doesn’t seem very democratic to me. Not just for my own benefit, but others should at least have the opportunity to attend tomorrow’s meeting and be able to run as a write-in candidate. Thank you, Pete. I have re-read these documents and want to clarify that I don’t believe the OBPB has misstepped in any way. Nor did they when I was Election Chair under the same rules and deadlines. It’s essentially the same rules for all community planning groups, and OBPB’s likely not even as restrictive as most. With that said, it’s still not a very democratic process if all election materials and all or most public notices come out after the last meeting is held via which the meeting attendance requirement can be obtained. I should know better, but not sure how most others are supposed to. Are any of the current board members termed out?